Uechun上中 is one of the most attractive shopping mall in Japan. The reason being that while it exists as a modern shopping mall, it is also a town where traditional downtown cultures of Tokyo can still be seen. Aside from the Japanese souvenirs for your friends and families, they also have lots of jewelries and accessories available for your own reward. They also have lots of highly fashionable products available as well, such as various Japanese designers brands achieving worldwide acclamation. Uechun上中 is also a town of art, the ornamental glass of the street lights designed by top Japanese artists are especially something that must not be missed. 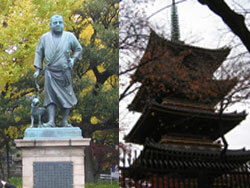 Ueno is an area where world class art museums and academic museums assemble. So you will be able to admire the first class artworks efficiently. The museum that took several years for renovation is a beautiful institution. They take you on a journey of time, into the future as well as to the past, make you feel like a real small or at times, huge creature, enjoyable to both adults and children. Will never let you down. There are variety of art museums, such as art museum originated from the properties of a Japanese businessman, and art museum that holds exhibitions of works by cartoonists/comic writers. There are various historical monuments such as the shrine and the graves of Tokugawa shoguns that reigned the whole country of Japan back in the days when “samurai” still existed in Japan, and the five-storied pagoda that's not gaudy but elegant. 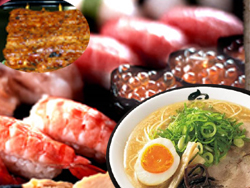 Sushi, Okonomi-yaki, Ramen (Chinese soup noodles), Unagi (grilled eel) There are lots of delicacies that can only be experienced in Japan as well. Here are some of the dishes we especially recommend! Recently, it’s become a delicacy that you could eat even in the countries outside of Japan, but the “real” sushi in its home country is exceptionally delicious. Although not recommendable to those who can’t eat raw fishes. Originally derived from Chinese cuisine, Ramen is a food that made a unique development after being introduced to Japan. Lately, even the Chinese people who are supposed to be its originators are deeply “into” the taste of Ramen. A dish that grilled a skinny long fish called Unagi (eel). Pouring special salty-sweet sauce over it is simply the best. How about things to eat for souvenirs? Talking about food in Japan, "safe" is probably the word that first comes up in people’s mind. Currently, the whole country in Japan is extraordinarily interested in what they eat, such as the environment they’ve grown, and how they’ve been processed or packaged. Due to such background, it could be said that Japan is one of the selected countries around the world that produces food that are safe and health-friendly. 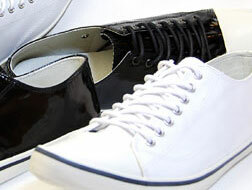 The Japanese fashion products acclaimed around Europe are also recommended. From sweets to salty stuffs, sold at extra-discount prices! Lots of choices to choose from too! You could get top designers brands at extraordinary discount prices! Of course things you see in fashion magazines are also available.